The performance of conventional Automatic Speech Recognition (ASR) systems degrades dramatically as soon as the microphone is moved away from the mouth of the speaker. This is due to a broad variety of effects such as background noise, overlapping speech from other speakers, and reverberation. While traditional ASR systems underperform for speech captured with far-field sensors, there are a number of novel techniques within the recognition system as well as techniques developed in other areas of signal processing that can mitigate the deleterious effects of noise and reverberation, as well as separating speech from overlapping speakers. Distant Speech Recognitionpresents a contemporary and comprehensive description of both theoretic abstraction and practical issues inherent in the distant ASR problem. This reference will be an invaluable resource for researchers, developers, engineers and other professionals, as well as advanced students in speech technology, signal processing, acoustics, statistics and artificial intelligence fields. Matthias Wölfel will finish his Ph.D on far-field speech recognition in the middle of 2007. He has given seminars in Speech and Robust Speech Recognition and has published more than 25 papers in this field. He has been involved in two European research projects on distant speech recognition: FAME and CHIL. He has written extensive sections of source code of speech enhancement, spectral estimation and feature extraction for automatic recognition, and has participated in NIST Rich Transcription evaluations with focus on far-field speech. John McDonough holds a Ph.D. in electrical and computer engineering from the Johns Hopkins Univerity. He has taught the courses Man-Machine Communication and Microphone Arrays: Gateway to Hands Free Automatic Speech Recognition at the University of Karlsruhe for five years. He has published dozens of conference and journal articles, and written complete software toolkits for source localization, beamforming and automatic speech recognition. 1.1 Research and Applications in Academia and Industry. 1.2 Challenges in Distant Speech Recognition. 1.4 Fields of Speech Recognition. 1.6 Organizations, Conferences and Journals. 1.7 Useful Tools, Data Resources and Evaluation Campaigns. 1.8 Organization of this Book. 1.9 Principal Symbols used Throughout the Book. 1.10 Units used Throughout the Book. 2.1 Physical Aspect of Sound. 2.3 Human Perception of Sound. 2.5 Recording Techniques and Sensor Configuration. 2.6 Summary and Further Reading. 3 Signal Processing and Filtering Techniques. 3.2 The Discrete Fourier Transform. 3.4 Summary and Further Reading. 4.3 Kalman Filter and Variations. 4.5 Summary and Further Reading. 5.3 Spectral Estimation and Analysis. 5.5 Comparison between Mel Frequency, Perceptual LP and warped MVDR Cepstral Coefficient Frontends. 5.8 Feature-Space Minimum Phone Error. 5.9 Summary and Further Reading. 6.1 Noise and Reverberation in Various Domains. 6.3 Direct Speech Feature Enhancement. 6.4 Schematics of Indirect Speech Feature Enhancement. 6.10 Joint Estimation of Additive and Convolutional Distortions. 6.12 Summary and Further Reading. 7 Search: Finding the Best Word Hypothesis. 7.5 Word and Lattice Combination. 7.6 Summary and Further Reading. 8 Hidden Markov Model Parameter Estimation. 8.1 Maximum Likelihood Parameter Estimation. 8.3 Summary and Further Reading. 9 Feature and Model Transformation. 9.4 Summary and Further Reading. 10 Speaker Localization and Tracking. 10.2 Speaker Tracking with the Kalman Filter. 10.3 Tracking Multiple Simultaneous Speakers. 10.5 Speaker Tracking with the Particle Filter. 10.6 Summary and Further Reading. 11.1 Uniform Discrete Fourier Transform Filter Banks. 11.6 Filter Bank Design of De Haan et al. 11.7 Filter Bank Design with the Nyquist(M) Criterion. 11.8 Quality Assessment of Filter Bank Prototypes. 11.9 Summary and Further Reading. 12.1 Channel Quality and Selection. 12.3 BSS Algorithms based on Second-Order Statistics. 12.4 Summary and Further Reading. 13.7 Summary and Further Reading. 14.2 Automatic Speech Recognition Engines. 14.4 Single-Channel Feature Enhancement Experiments. 14.7 Speaker-Tracking Performance vs Word Error Rate. 14.11 Summary and Further Reading. B.5 Super-Gaussian Probability Density Functions. B.8 Transformation Law of Probabilities. B.9 Cascade of Warping Stages. B.13 Proof of the Nyquist–Shannon Sampling Theorem. B.14 Proof of Equations (11.31–11.32). B.16 Derivatives with Respect to Complex Vectors. 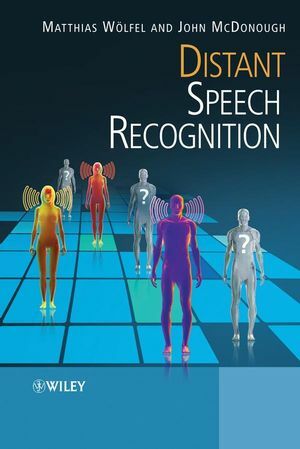 Distant Speech Recognition Visit for more information in the area as well as additional material related to the book.